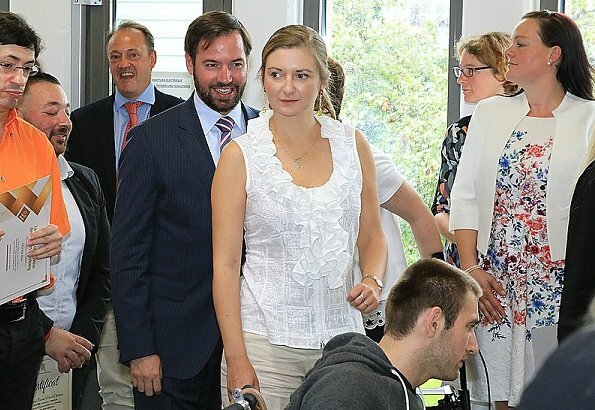 On June 12, 2018, Hereditary Grand Duke Guillaume and Hereditary Grand Duchess Stéphanie of Luxembourg visited the Kräizbierg Foundation in Dudelange, which helps people with disabilities. 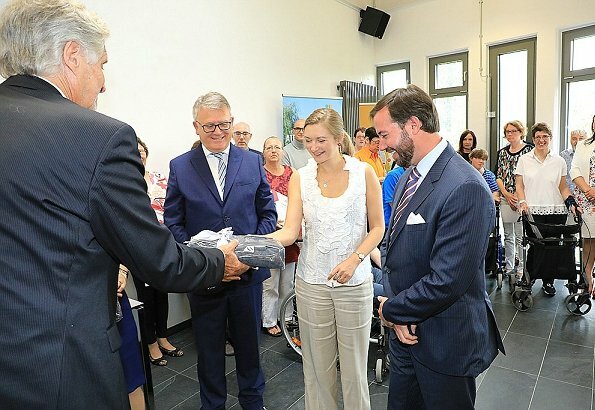 Prince Guillaume and his wife Stéphanie attended certificates presentation ceremony held for people with handicaps who have completed education at Kräizbierg Foundation Training Department. 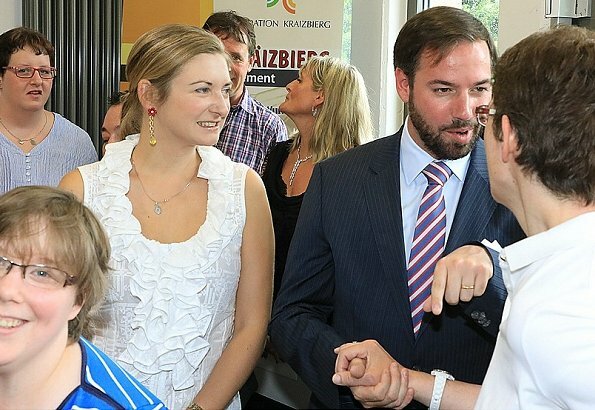 In existence since 1977, the Kräizbierg Foundation is currently home to around 130 people with physical disabilities. 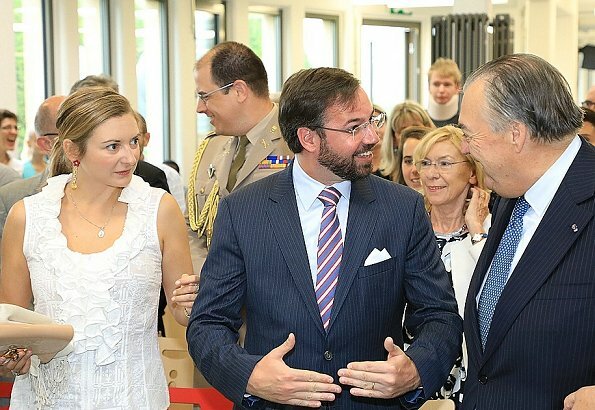 Hereditary Grand Duke Guillaume is the honorary president of Kräizbierg Fondation. Why is she so uninterested for her appearance? Very pretty blouse, and good color coordination between the sandals and pants... it is too bad that the pants became so wrinkled, but that is sometimes difficult (if not impossible) to avoid. A nice updo would have created a better look for this occasion, imo. Sie ist ein Schatz. Outfit ist auch OK. Locker, leicht und sommerlich! Too many flounces, too many wrinkles and a folded shawl to achieve the Linus effect. An easy going outfit for this event. I love the Earrings they are beautiful. The colours are very flattering, love everything about the white blouse and not so much the wrinkels of the pants. Maybe a light, young updo would have been better. She looks just fine. When Letizia had wrinkles nobody said anything. I find her countenance very pleasant and honest, which cannot be said about many of the current or future queens. She could do better, in terms of her external appearance, but she may prefer spending her time and money on more substantial things. 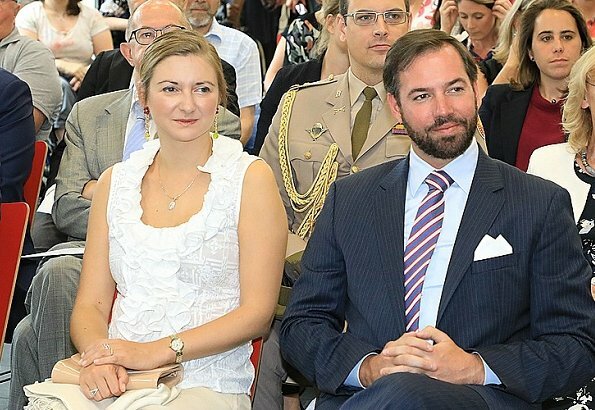 And it’s almost hilarious how similar looks on Letizia or Mary of Denmark get all the ‘approvals’ from select commentators and then Stephanie an MM get all the criticism. 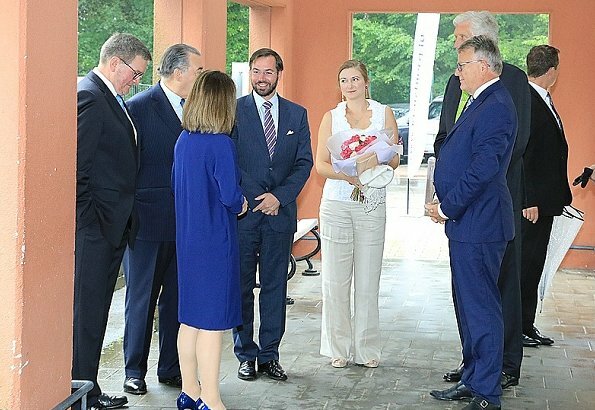 Not saying that Letizia and Mary don’t have significantly more polished looks, but then they can do no wrong and the other two... well, you get my point. Perhaps a bit more objectivity would do us good (including myself in that category). 3 veces Letizia y 2 veces Mary en su comentario, haha. La respuesta es sencilla. 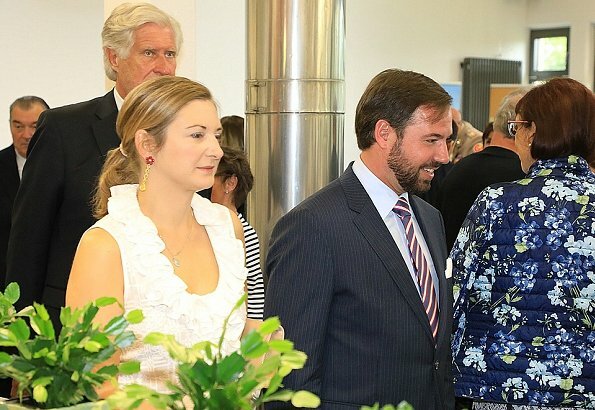 Esto es un blog de moda Royal. 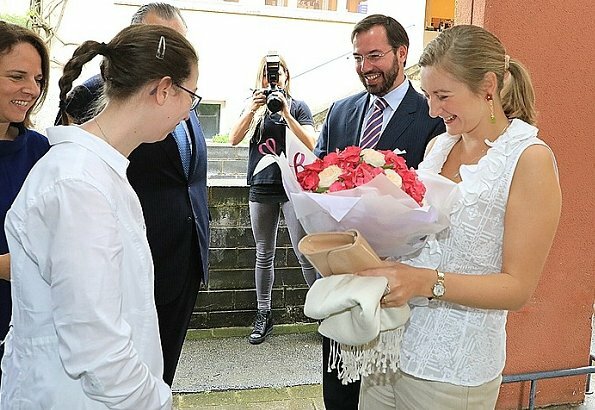 Letizia y Mary reciben aplausos porque suelen vestir muy bien, al igual que otras. Stephanie y M-M suelen recibir críticas porque visten mal con mucha frecuencia. No hace falta buscar conspiraciones. 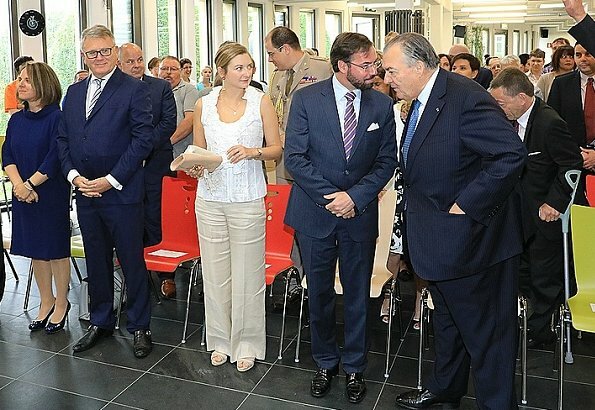 No me puedo imaginar a Mary o a Letizia con esas arrugas. Como todas, tienen días mejores que otros pero este nivel de desaliño, en el pelo o la ropa, nunca. Is MM Mette-Marit or Meghan Markle? What Angie said. This lovely and accomplished woman can stand on her own. No need for comparisons, which sound more like whining. have a look at Mary in this wrinkled skirt..
No insistas, Anónimo, porque no hay comparación posible. Además,como se dice en España, un grano no hace granero. Qué horror de pantalones. Anchos y arrugadísimos. Camisa mona. En general, muy corrientita. No parece una Royal. Poco esfuerzo. OMG. I can't imagen the day she becomes Great Duchess. She has to work very hard on her image until then. No me importan las arrugas porque es un pantalón de lino, fresco y ligero y así es como debe ser. La blusa tiene demasiados volantes, pero no se ve mal. A mí me gusta hoy su apariencia, no va repollo, aunque la coleta podía ser más pulida. Cute blouse but the slacks ruin the look. Her choices are odd - the statement earrings don't go with the small necklace and, worse, she has her hair held back with a simple elastic band. She looks fine here - the trousers are a bit creased because they are linen, can't be helped. But at least they are neither too big nor too small. I think the top is pretty. 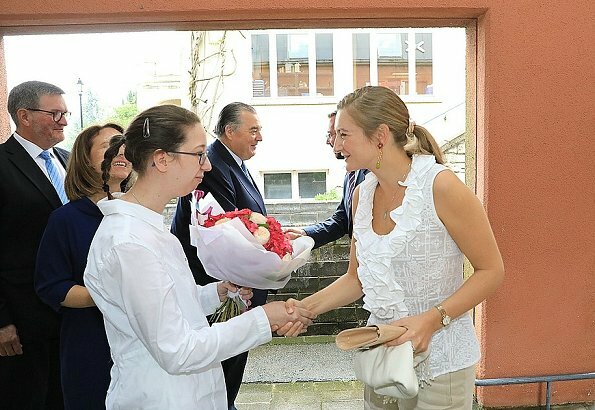 Je suis désolée mais, à part les boucles d'oreilles (et encore là, elles ne vont pas nécessairement avec le style de vêtement), je n'aime pas la tenue de la Grande-Duchesse Stéphanie. Avec un teint si pâle, tout paraît terne. Est-ce le tissu, la confection? Je ne sais trop. 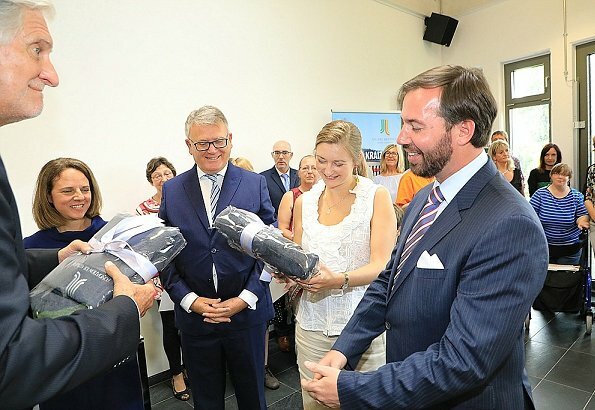 Une petite veste aurait peut-être réchappé le tout. Linen is a lovely material, especially when it is hot weather! I wear it very often, andd, yes, it creases, but it does not matter i m h o. Better a bit creasy than sweaty!